There are 12 posts filed in Windows (this is page 1 of 2). On the Windows box, fire up Microsoft Management Console (mmc.exe) and add the Certificates snap-in. Choose Computer Account and then Local Computer. Find the certificate that you want to export and choose All Tasks > Export. Follow the Export wizard and make sure you export the private key too. You’ll be asked for a passphrase to use to encrypt the key. Take the PFX-format file that was created by the wizard and copy it to your UNIX machine. The PKCS12 output file is basically a concatenation of the private key and the certificate, so use vi to slice it up into two files, a .crt for the cert and a .key for the private key. That’s it! You can now use the key and cert in your Apache config files. Devlin’s rebuilding its intranet and moving away from the old Lotus Domino-based directory service. One of the developers on the intranet project asked me if he could authenticate employees against Active Directory instead. He’ll be using the MODx CMS, and would like to authenticate using mod_auth_ldap. We’ve done this before to authenticate Subversion SCM users, but just as a test. This time I decided to try and create a user in Active Directory that would be used solely to bind to LDAP when doing lookups. I called this user “LDAP User”. Making this work required a lot of trial and error, and I still haven’t managed to figure out a few things (see below). The first problem I had was that I was confused as to what the CN actually is for this particular user: it’s going to be cn=LDAP User, cn=Users, dc=devlin, dc=ca rather than cn=ldapuser, cn=Users, dc=devlin, dc=ca. ldapuser is just the login ID of the account rather than the actual CN. I’m not particularly impressed that AuthLDAPBindPassword is stored in cleartext in the configuration file, but there doesn’t seem to be a way of hashing it or otherwise concealing it. I haven’t figured out how to enable LDAPS on Domain Controllers that aren’t already HTTPS-enabled, so for now I’m not authenticating against them. … since I have to grudgingly administer some Windows boxes, I’m finding this site pretty valuable. For example, someone asked me this morning if we have inbound and outbound message size limits in Exchange. This article explains how to find that information! At my new company I unfortunately have to deal with Active Directory. I understand that AD is supposed to be the authoritative source for any information about users, groups, computers, and so on, but does the interface have to be so crammed with junk? 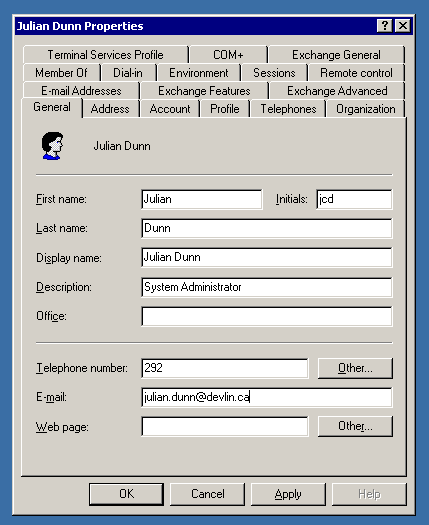 This has got to be the worst interface I’ve ever seen (Lotus Notes aside, but I’ve never had to administer Notes). It’s not clear where to find anything! Not only is the interface kludgy (multiple rows of tabs?) but the tab labels are totally non-intuitive. Why are there at least four tabs pertaining to e-mail (Microsoft Exchange)? What the heck is the Member Of tab for, and how does that differ from what I might find under Account? I can’t imagine trying to administer hundreds of users with this kludgy tool. Thank God our company is only < 50 people. If you want a good laugh, head on over to windowscrash.com. There’s nothing like a whole gallery of BSODs showing up on public billboards, airport screens and payphones to demonstrate just how unstable and unusable Windows is. There’s also a fantastic collection of meaningless and just downright hilarious Windows error messages there. My favourite is this one entitled Mouse. This one comes a close second though. Wow. It’s been a while since I last wrote. Happy Hallowe’en, by the way. I now work for CBC.ca in the New Media Production & Operations department as a software developer. Primarily this involves Java development, but I also do a bit of Perl (as much as I hate to). I also weigh in on system administration matters quite a bit, since I think of myself as a half-time sysadmin, half-time programmer. I just had to respond to this slightly brain-damaged article which appeared in eWeek recently. Now I know eWeek is one of these magazines for PHBs but I still like to flip through it (very briefly) to see what the PHBs are being told these days, and how I can counteract that. So this article — if you go and read it — basically says well, Microsoft has to make "Longhorn" really secure, and improve their security in general, or else legislatures will impose security warranties upon software developers, and this will impact all developers and not just Microsoft. Such an earthquake could emerge not just from legislatures but also from courts. All it would take would be a precedent-setting ruling that the “we’re-not-liable” language that’s commonplace in shrink-wrap licenses is “unconscionable and unenforceable.” The lawsuits would fly. I think he’s bang on — but the lawsuits should fly, in fact, if the software is defective. This would certainly stop not only Microsoft from shipping poorly-tested products, but all software vendors.